Another item from my unfinished project basket is complete! This is the "Be My Valentine" DYB round robin that I participated in back in 2012. Shortly after I sent these blocks out, my Mom got sick in Costa Rica and subsequently passed away, so I ended up doing almost no stitching in this round robin and someone else took over my spot. 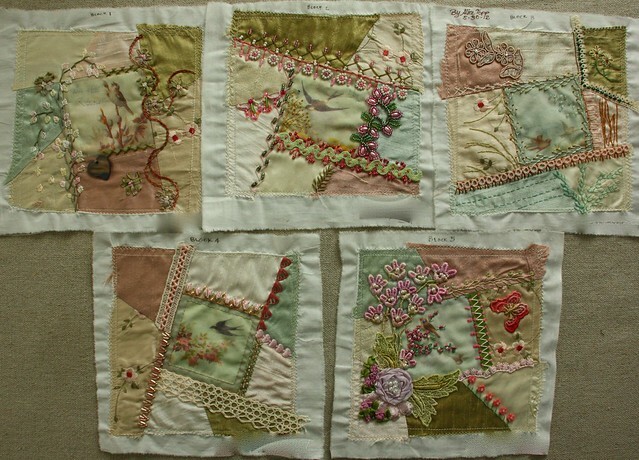 But my blocks got to continue through the rotation and came back to me, beautifully embellished! How nice to have this one finished! 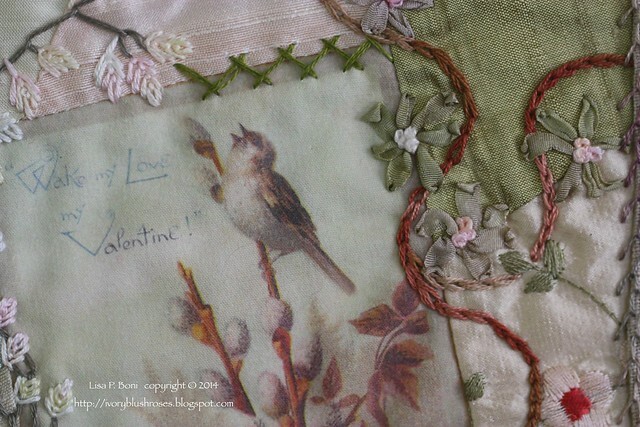 I fell in love with these vintage bird valentines and drafted two different crazy quilt blocks to use them on. To vary them, I simply rotated the block designs. It was something I had never done before and they turned out to be some of my favorite pieced blocks, so I definitely need to remember to try this again. 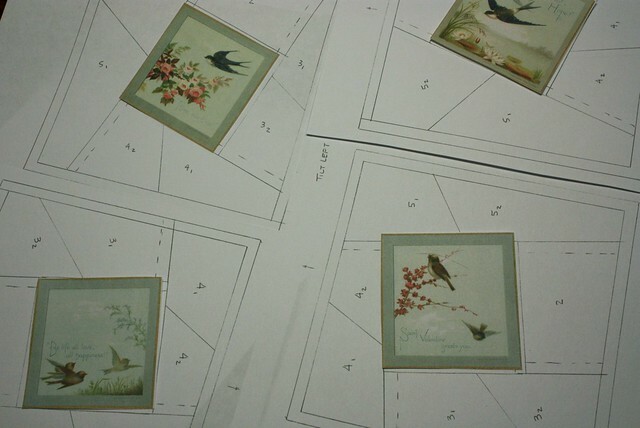 These are the pieced blocks placed in the order I wanted them to go. Here are the blocks as I received them back! Everyone did a wonderful job of keeping to the colors in the blocks as I had asked. They also did a nice job of maintaining the somewhat "Zen" feel to the blocks. 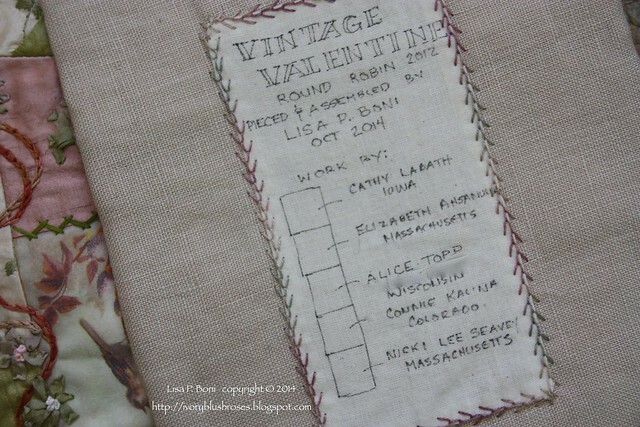 Cathy Labath stitched this block and it is overwhelmingly my favorite of the group. I love them all, but Cathy was able to interpret the feel I was after perfectly! 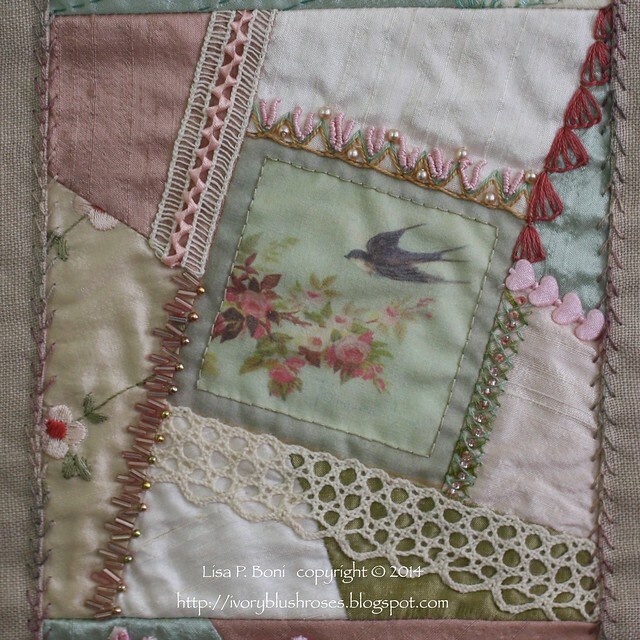 Elizabeth Ahsanullah stitched this lovely block! Gorgeous beading! Alice Topp completed this block. 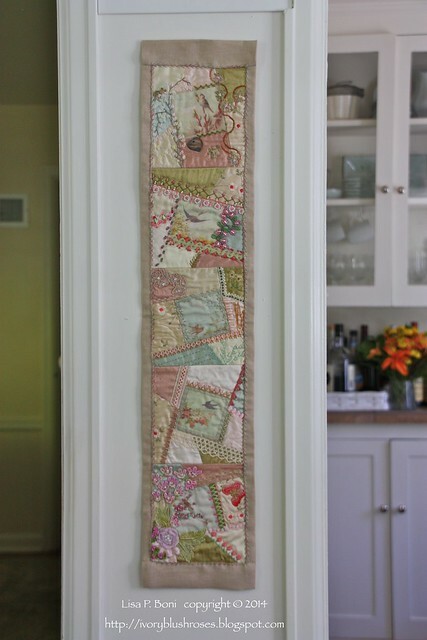 I loved how she kept things simple and in the colors of the block and added some background stitching to create interest. 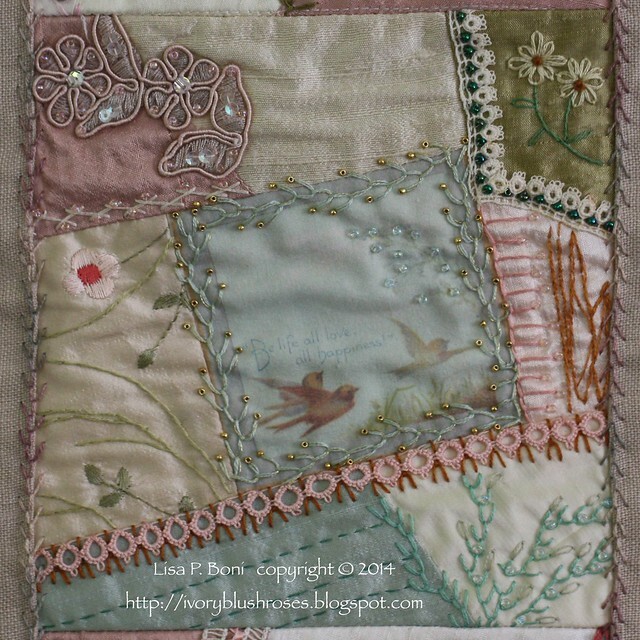 Connie Kalina stitched this block. She also did a fabulous job of keeping the serene and simple feel that I had hoped for! 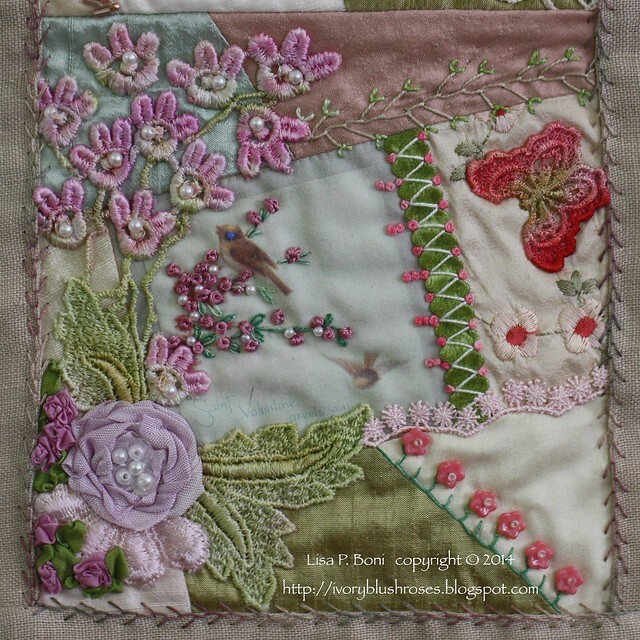 Nicki Lee Seavy stitched this lovely block. 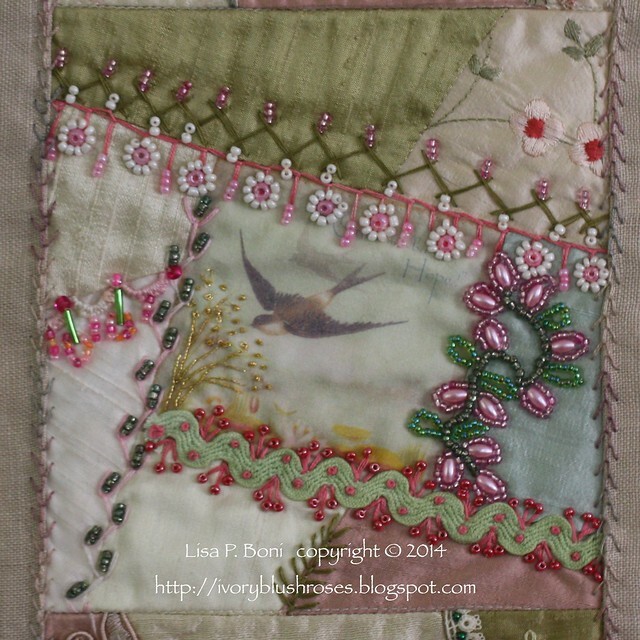 She creates lovely hand dyed lace and incorporated some of it into this block. On the back I added a label in order to remember the ladies who participated in this round robin and where they were from. 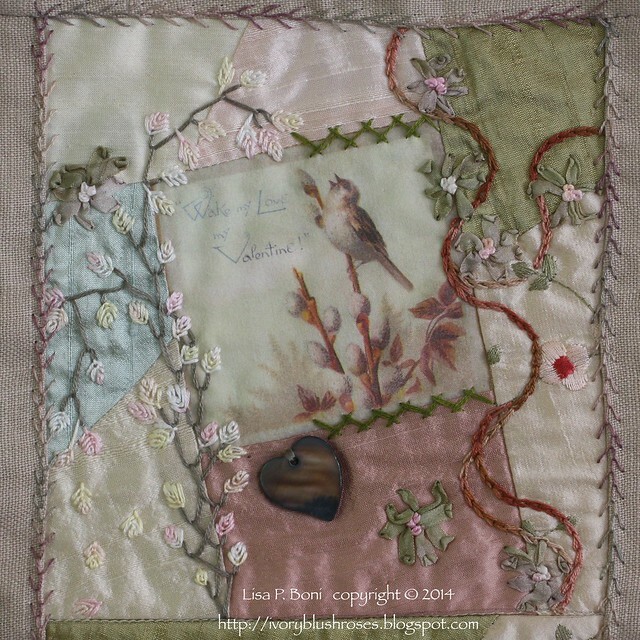 For the backing, I used a linen fabric with a color that blended well with the silk blocks. I used a variegated thread around the perimeter in a feather stitch. 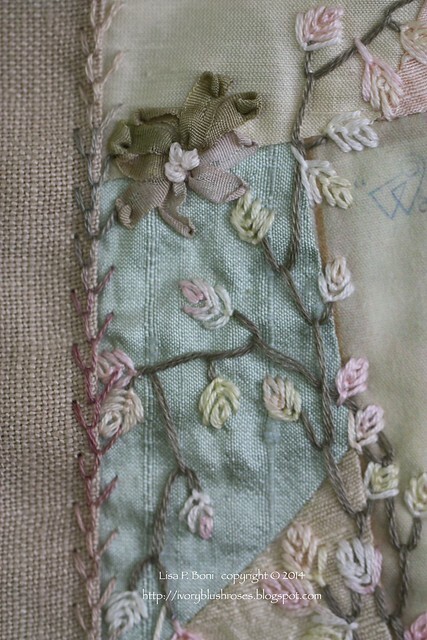 Here you can see some of Cathy's fly/fern stitch leaves up close. I just loved these vintage valentines! Such sweet birds and sentiments! I also love Cathy's green flowers on this block. It's something I would never have thought to do, but they are simply perfect and just the right embellishment to this block! It's a good reminder that sometimes it doesn't hurt to stray from what one "expects" to see! Before I go, I have to share a photo of my sweet Mollie Kitty! I'm so grateful that she seems fully recovered from her illness this past spring! 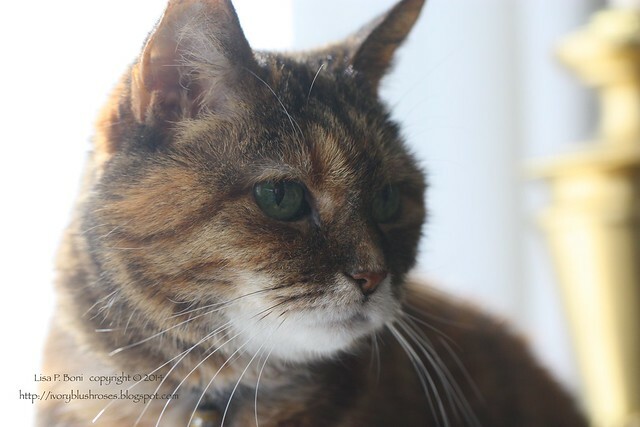 At 14 years old, going on 15, she is still kittenish in so many ways! She brings so much joy to my life! I hope we have a few more years together! Thank you all for your gracious and kind comments about my last blog post! I'm so glad to know that so many of you are uplifted by my blog! Beautiful work as always! I love how you finished your blocks! What a lovely piece. You used all those wonderful blocks so creative, I loved it. Your furry friend is so cute, I have two of them, they are real joy for us. So pretty... I just sigh, enjoy the eye candy and think about how talented you are. I look in my feed everyday to see if you have posted any thing new. Thanks for sharing. Molly Kitty is very pretty and sounds like a wonderful companion. So beautiful!!! What a treasure!